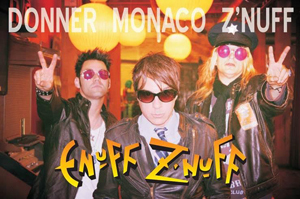 Frontiers Music Srl is excited to announce the signing of ENUFF Z’NUFF to the label for the release of a brand new studio album to arrive in the Fall of 2016! Wrongly lumped in with the disposable pop-metal bands of the late '80s, ENUFF Z'NUFF are instead a truly gifted power pop act. Founded in Chicago in 1984 by Chip Z'Nuff, ENUFF Z'NUFF arrived with their self-titled debut in August 1989, scoring a couple of hit singles with "New Thing" and "Fly High Michelle". The follow up was 1991's Strength album, where the band had noticeably toned down their image and turned up their creative ambitions to deliver a masterful '90s take on the crunchy power pop sound of CHEAP TRICK and BADFINGER. As of today, ENUFF Z'NUFF is still going strong and continues touring the globe. Singer-songwriter Johnny Monaco now fronts the power-pop trio along with co-founder Chip Z’Nuff and drummer Erik Donner.